I was playing with a stamp that I have never used ....bought at a local discount store ...and ended up making this card which I am entering into a couple of challenges. The photo is not as crisp as I would like...shows more grey than white. Really Reasonable Ribbon: Challenge #5 is a Black and White color theme. All entries must use ribbon, lace or trim of some kind and the main colors should be black and white. Can add a splash of color but the main colors must be black and white. 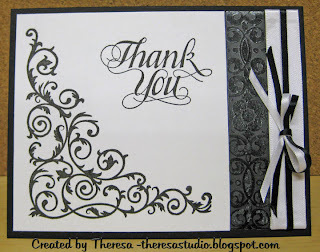 What an elegant black and white card! Thanks so much for joining our Really Reasonable Ribbon Challenge. Very elegant!! 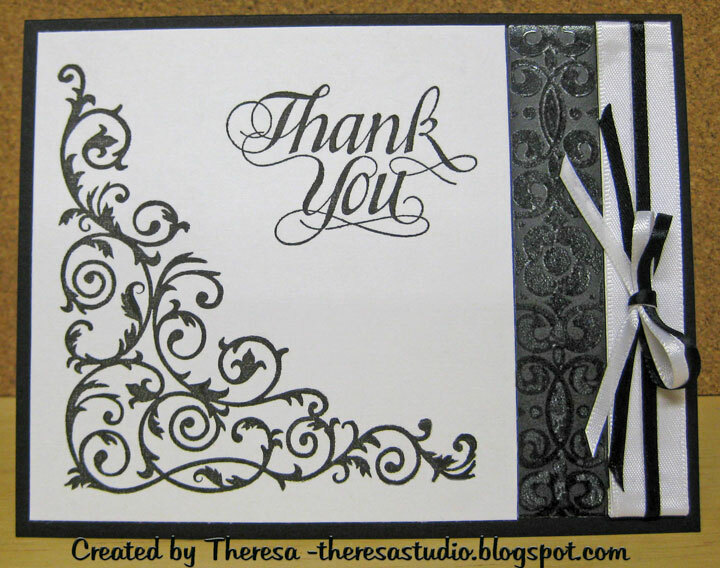 Beautiful card Theresa! !